FLORIJN Watches has launched its first model in 2014. We would like to explain you more about the watch, used materials and features. In order to realise the above goals, we work with the best materials when manufacturing our watches. The FLORIJN watch case is made of stainless steel. Stainless steel is characterised by its lack of sensitivity to external influences, such as water, oxygen et cetera. It is also a very durable material, so it doesn’t scratch or damage easily. The black case is stainless steel with Black DLC (diamond like carbon) coating. The roof of the Chrysler Building in New York was fitted with stainless steel cladding when it was constructed in the late twenties. After nearly 90 years, it looks virtually the same without any further treatment. Sapphire glass is strong and ensures a clear view of the watch face. It is important that sapphire glass is also scratch-resistant when used intensively, ensuring carefree use. Be carefull with diamonds; diamonds are harder than sapphire glass, so please be careful with any diamonds rings. This may cause scratches. But otherwise you will notice this glass is durable, hard and scratch resistant. Opting for mechanical timepiece was the obvious choice, because you never have to replace a battery. The FLORIJN comes with a Seiko-mechanism, because this mechanism has proven to be a reliable and robust heart for a watch. The mechanical watch is being 'charged' by simply wearing it and the movement of your wrist. This is why the FLORIJN wearer always has the accurate time and date. With a power reserve of approximately 40 hours the watch continues working even if you don’t wear it for a day. Our FLORIJN watch always has a suitable rotating bezel. For travellers or more internationally minded wearers, we offer the dual time / hours bezel so you can easily read the time in different time zones. The minutes are indicated on the bezel for your convenience. A FLORIJN is waterproof up to 300 metres (30 ATM). So with FLORIJN you can swim and dive to your heart’s content. If you have a watch that indicates that it is waterproof without stating a dept or a pressure, the watch is only splash proof. In reality, a watch with a water resistance up to 50 metres is not suitable for swimming. 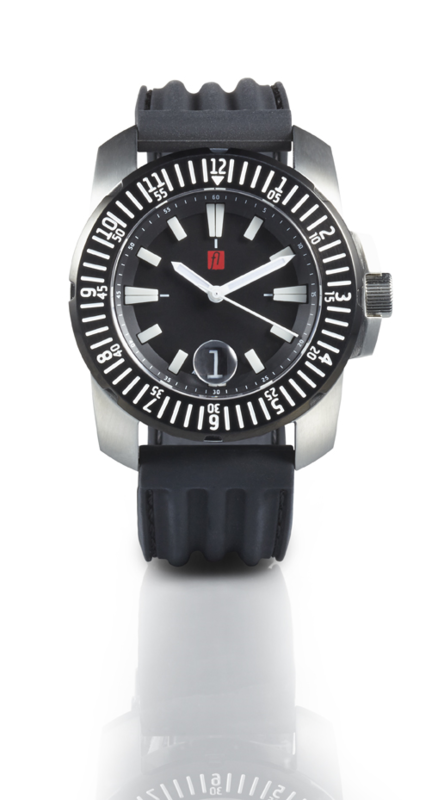 But with a FLORIJN watch you can swim, snorkel, dive and more without worry. To guarantee this water resistance up to 300 metres, a certain case thickness is required. But regardless of the dimensions of the watch (width: 45 mm) due to the lugs and a case length of 53 mm, FLORIJN has designed a watch that is comfortable to wear. And with a thickness of 14.1 mm the watch also fits comfortably beneath your shirt cuff! The hands and indexes are fitted with luminous paint (Luminova) so you can read the time in the dark much better. A luminous coating (Luminova) provides long-term illumination in the dark after only a short exposure to light. You can wear a FLORIJN for business as well as after working hours in more casual circumstances. The watch is conspicuous, but it doesn’t draw all the attention during a conversation. Its graceful appearance comes in handy at work, but its sporty look also fits well with a casual outfit. In short, it is a professional watch that is flexible enough to fit all occasions. Due to the finish of the watch case and the combination of the brushed and polished steel on the rotating bezel, the watch is full of character. Details such as the FLORIJN logo on the crown complete its look. And when you wear our timepiece with a thick leather strap of quality black leather, the watch will only get more beautiful the more you wear it!